Russians make and eat a non-toxic version of the infamous death cap. Death caps as a snack? Known as `mukhomory’ in Russian, this dish can be entertaining for children, unusual for guests, and still completely safe! In Soviet times mothers often used art when cooking for children – even if the recipes were simple. Moms realized that a bowl of porridge is more attractive to a picky child when it’s decorated with a smiling face using homemade jam. My mom, for example, would make a piglet walking in the forest by using sausage and various herbs and vegetables from our dacha garden. Such recipes do not require much time or skill – just a bit of inspiration. They also prove themselves exciting for children who might be eager to help prepare these entertaining dishes. Mukhomory, known in English as "death caps," are one of my favorite childhood recipes. 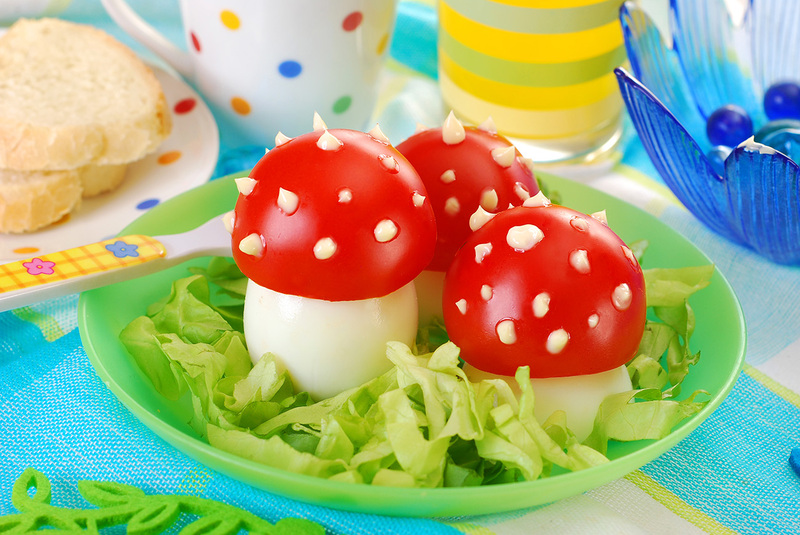 This might at first sound strange, but many Russians remember this egg dish in the form of bright red mushrooms that use tomatoes as the caps. The ingredients are simple, most of which are commonly grown in Russian gardens. Mukhomory also are perfect for parties because they look bright and original. Be warned, however; this dish doesn’t usually stay for long on the table! When I was a kid, we used to make a simple version of Mukhomory, but later I came across other more complex and exquisite versions. In my family the `death caps’ were made of plain boiled eggs, but in other receipts they are stuffed, which makes the dish more interesting. It’s good to improvise and experiment with various fillings. 1. Hard boil the eggs, then put them into a pan with cold water and wait for about two minutes. Shell the eggs, cut away the tops and the bottoms so that the eggs can be placed in vertical position. Remove the yolks carefully, retaining the shape of the eggs. 2. To make the filling, grate 1 garlic clove and cheese, then mix with the yolks and mayonnaise, adding a pinch of salt. You may also add cut dill. 3. Stuff the egg whites with the filling. Put the eggs on a dish to act as the stems. 4. Cut each tomato in half – to be the mushroom caps. Place them onto the egg stems. 5. Top each cap with spots, using mayonnaise. Traditionally, such spots were put on tomatoes using a fork, but you can also use a toothpick. 6. Decorate the dish with herb twigs – use dill, parsley and onion leaves to imitate the grass. Feel free to choose the herbs you prefer – for instance, lettuce or sorrel also work to create a bright mushroom meadow.